Are you a creative thinker? Do you like to solve puzzles? I love to think. Sounds very simple….it’s not. Life is full of distractions. So many people rush…just so they can call out “Done!” first. There are benefits to taking time to think. Are you looking to get to the next step quickly? Or are you looking to get to the right step? It’s a choice. Not taking time to think about a particular concept or problem usually results in an idea that is simply”just okay”. It might work out for a little while. However, most likely it will need a redo…and you will need to take time to think some more…. Try to look at things from a bird’s eye view. As the saying goes, “think outside the box”! Then you can brainstorm solutions, develop options, evaluate and pick the best solution…. When do you think best? Gypsy World Spice Cafe Blogiversary! great post, very true. sometimes we are in such a rush to “check” off our list we really do not take the time to think. When my kids were younger I used to wake up extra early to simply have a little alone time. I should really make the effort add this to my day again. happy weekend! I know what you mean…. I also like to get up earlier to get quiet time … It is so peaceful….early morning coffee in silence… Have a great weekend! The good thing about thinking is that it doesn’t require a lot of energy… Just time… Have a great day! I find that I think best when I go out for a walk & completely unplug for a while. 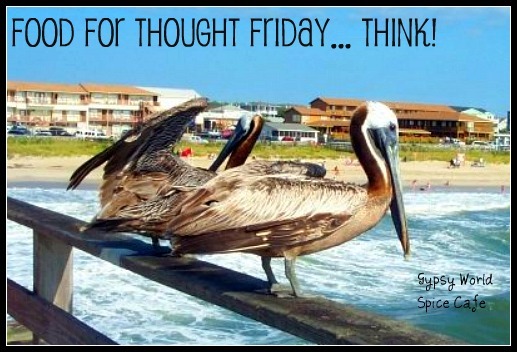 I like this post and want to thank you for getting me to think about thinking 🙂 .